1. Preheat the oven to 160°C, gas mark 3. Remove any string from the pork and rub all over with the salt and pepper. Place in a roasting tin and cover tightly with foil. Roast for 2 hours, then uncover and baste with the juices. Re-cover and roast for another 2 hours until there is no pink meat and the juices run clear. 2. Remove the foil and carefully lift the pork onto a plate. Skim off any excess fat from the tin, but leave any roasting juices (add a splash of water to loosen if needed). 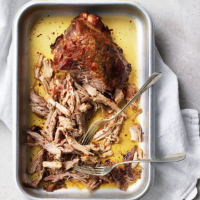 Return the pork to the roasting tin and shred with 2 forks, turning the meat in the juices. 3. Warm the sauce ingredients together in a small pan over a low heat until the sugar dissolves. Pour over the pork and toss together. Serve with coleslaw and baked sweet potatoes, if liked, or piled into buns. If a whole pork shoulder is not available from the meat counter, use the same weight in shoulder steaks instead.